Nobody needs a degree in color theory to plant a garden. You can keep the color wheel if you'd like, but look at it as a helpful tool rather than your sole guide to garden color. After all, it's not about what colors you use, but how you combine them - and more importantly, in what amounts. Even colors that normally clash can be combined in such a way that they're made to sing in tantalizingly rich and intricate harmony. The planting pictured above works because of the way the different colors effortlessly blend together; the icy lavender hued petunia seems to melt into the mauve coleus, which itself mingles with the flaming lily. The tree in the upper right hand corner has chartruese leaves, but at a distance it looks no different than the yellow flowers to the left. Look even more closely, and you notice echoes of yellow in the unopened lily buds and grasses lit up by sunlight; or the way that the green bushes in the upper left hand corner take on a blue shade when cast in shadow. The secret ingredient that pulls it all together, is the color green. Luckily plants have plenty of that to go around. 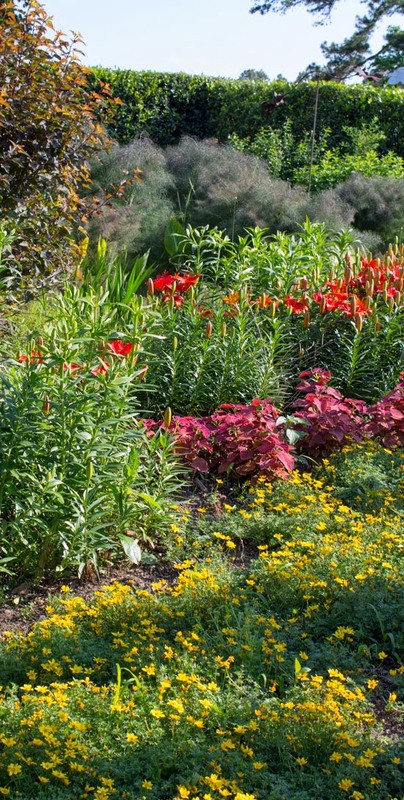 Not even the best gardens can keep their beds full of leafy, flowery goodness all year long. You can drop a few hundred dollars on annual flowers, but it would all go to waste if not for structural plants to pull it all together and keep the show going after the flowers fade. There are bound to be bare patches while you're waiting for the newly planted groundcovers to take off, or when those caladiums are taking their sweet time even though everything else has leafed out. 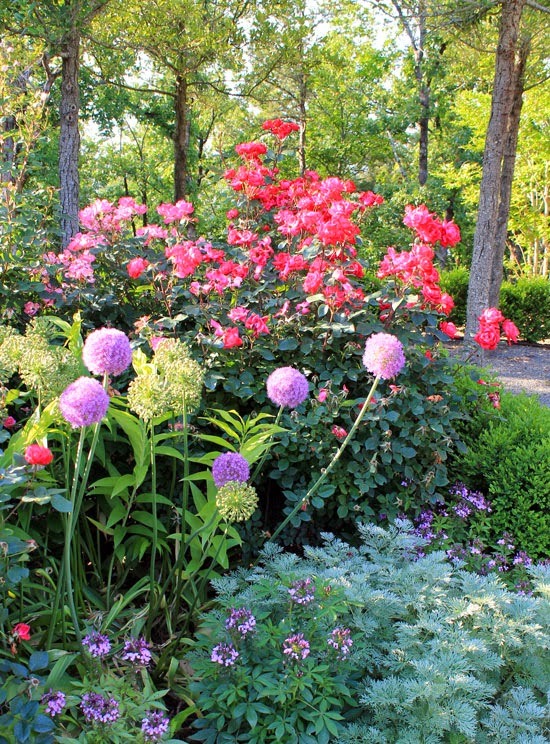 That's why it's important for you to choose a few dependable plants that keep their attractive foliage even when out of bloom, and spread them out. 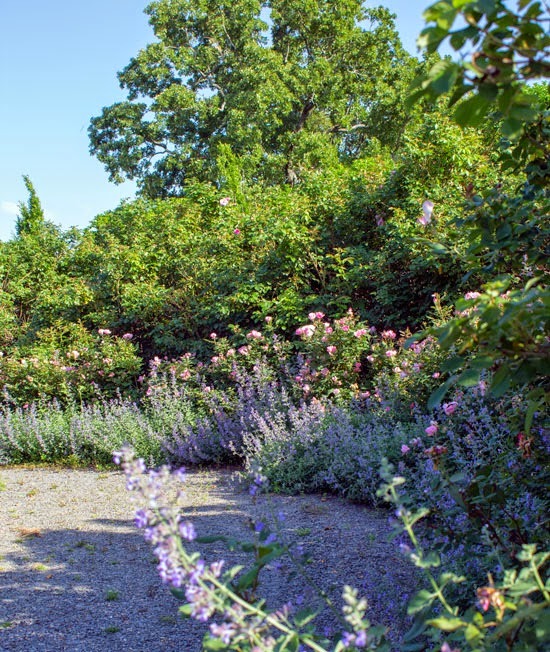 Reign in your plantings with borders of Liriope or low hedges of boxwood, and give them a solid backdrop of evergreen shrubs like Podocarpus or hollies. Use deciduous plants with interesting trunks and branches like crepe myrtles or red twig dogwoods to provide structure and impact over the winter months, and plant summer bulbs like elephant ears (Colocasia, Alocasia spp.) or cannas for impact in the summer months. Does your garden look as if a child has dumped a bucket of legos on the grass for you to pick up? If you look at your own garden and it looks like a total mess, it's probably lacking something called unity. It's as if all of those individual plants are at odds with one another in a competition for your attention, making our eyes dart back and forth madly with nowhere to rest. Overly convoluted analogy aside, a busy garden can give you a headache. 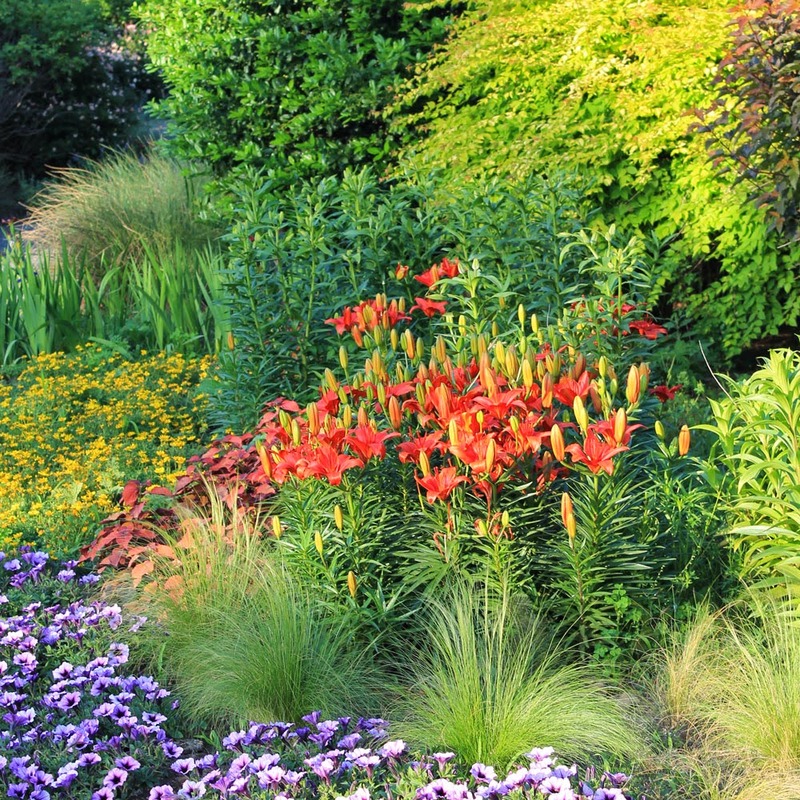 Make peace with your flowerbeds by choosing a few reliable plants, and planting a whole lot of them together as if they were rivers or carpets throughout your garden. By letting them carry the weight of the composition (or by making it a composition in the first place) you're making the garden easier on your eyes and easier to care for too! It's a lot easier to meet the needs of a few different plants than it is to stay on top of a messy lego spill of plants with different needs. Even a small garden can be made to look a lot larger by leaving desirable views open, and I'm currently doing just that in my own small garden. While I am planting tall shrubs and trees to cover up views of my neighbors' houses, I'm keeping the view above the fences open wherever I can snag a view of a neighbor's sun-dappled treetops. I might not have a sweeping vista over the Arkansas river, but I do have a very nice view of my neighbor's pindo palm and split-leaf philodendrons. 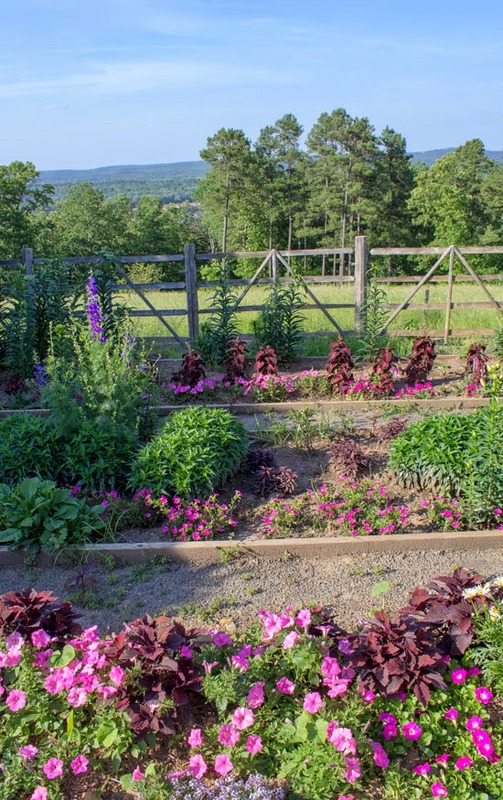 To take this view-stealing a step further, try borrowing elements of the scenery in your own garden like P. Allen Smith has done here; by laying his rustic raised beds parallel to the overlapping hills in the distance and planting them with cool colors of blue, mauve, green and lavender. Anything hotter and brighter than that would distract from the scenery. Even if the only attractive view beyond your property is the sky, there are few vistas more breathtaking than mountains of storm clouds at sunset. Leave that view open! You don't want your home to look like an open book to neighbors, and you wouldn't want your garden to read like one either. Hedges are often planted to create privacy between properties, but they're also exceptionally suited to divvying up your own yard into rooms and passages that beg to be explored, giving visitors and yourself an experience that can be sipped slowly rather than gulped down in a single view. 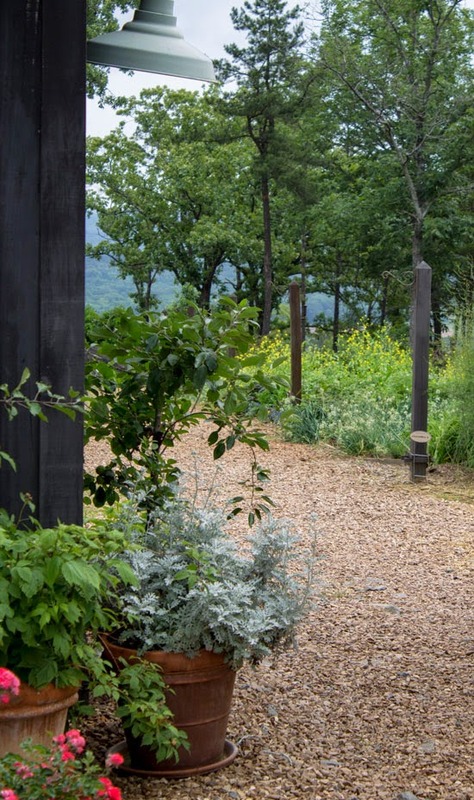 Plantings like these don't have to obstruct your entire view like the walls of your house; they can be low enough to hide pathways and other surprises until visitors reach the other side. You can use tall perennials and vines on supports to get the same effect! In case you were trying to decide between growing flowers or food, rest assured that you can have your garden and eat it too! 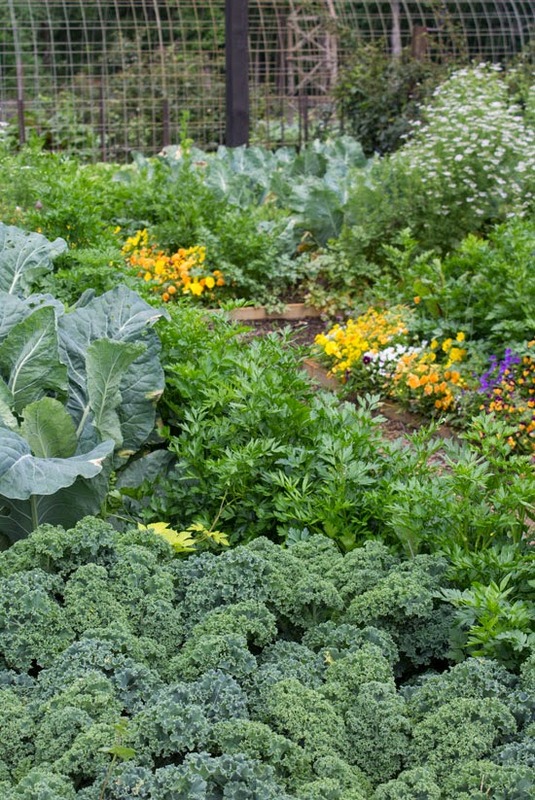 Many edibles are attractive enough to make it on their good looks alone; herbs and leafy greens provide textural interest, and the edible blooms of nasturtiums, daylilies, pansies and squashes bring color to both your plate and garden! 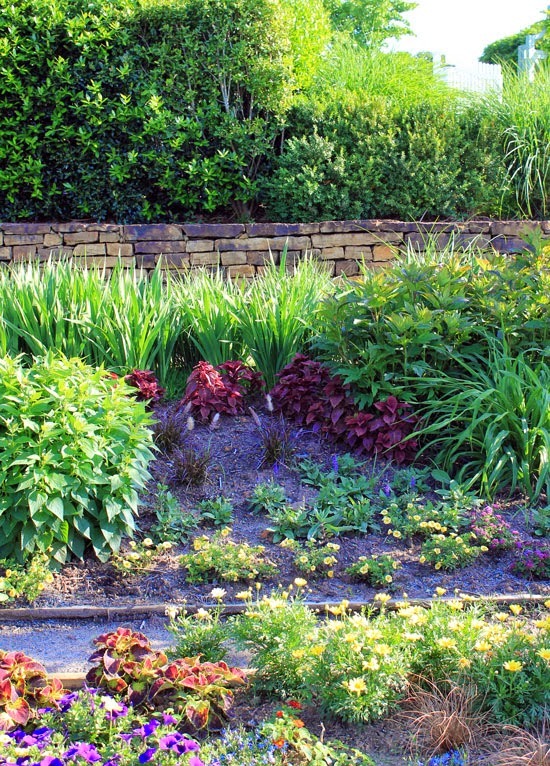 You don't need to go all out edible - just tuck a few of your favorites in among your flowerbeds to save time and space. The key to making edibles look good enough for the front yard is to choose good plants and keep them well watered and fed. Pictured above are veggies and herbs from Bonnie Plants, all fed with Jobes Organics fertilizers. "Oh, we just picked this piece up at a charming seaside village in the south of France." Conversation pieces needn't be exotic or expensive, just interesting enough to catch the eye of visitors! 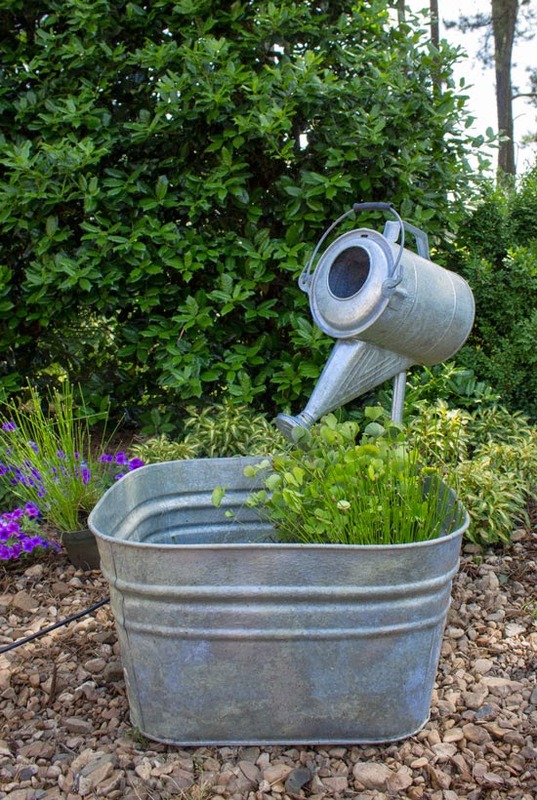 This water feature was made by Chris Thier of Laguna Ponds at the 2014 Garden2Blog event, using nothing more than a pump kit, rubber hosing, a galvanized tub and a watering can. To make your own DIY projects, look for interesting finds at thrift shops, garden centers or yard sales and use broken pottery to make mosaics, cracked flowerpots to create miniature gardens and turn old signs into readymade wall art. Let your imagination run wild! Have you ever noticed how the bookshelves and kitchen cabinets in magazines look so darned neat and organized? Take a second look at those picture perfect examples of organization and you'll note that the books and dishes are all the same color palette; and the same elements, be it baskets or a collection of white bowls, are repeated throughout. Much like tip #3, this tip is all about restraint. Collecting plants is one of gardening's great joys, but too many different specimens, colors, shapes and forms can make a landscape look cluttered and chaotic - or even weedy. To make your garden look tidy and neat, start by making sure that plants are in the right places to begin with; growing in the right spots with the right amount of sun, moisture and drainage. Then start by making a 'bookshelf' with framing devices such as edging or shrubbery. 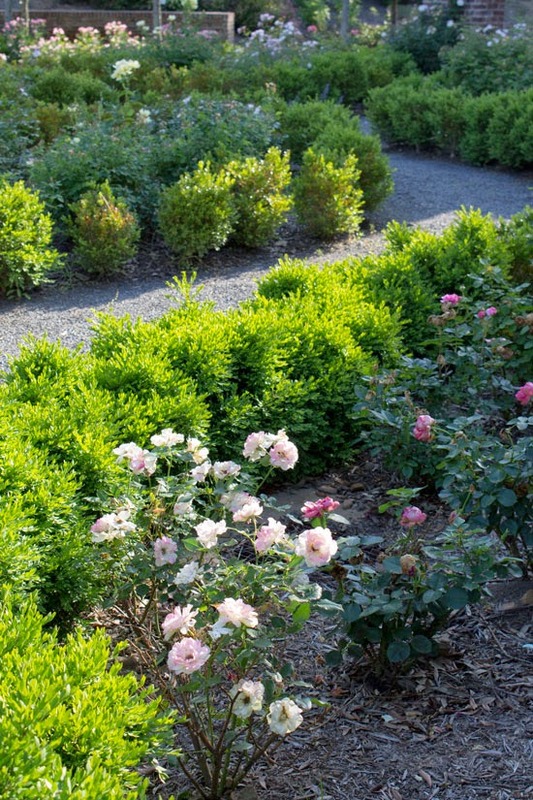 Consolidate your treasures with an evergreen border such as the clipped boxwood seen above (or a low-maintenance edging of Liriope) and you'll have year-round interest and order. Lastly, pick up your garden like you would pick up your room by keeping the beds free of weeds, branches and trash, and by keeping up with basic housekeeping chores like mulching and clipping the hedges. It makes a world of difference. 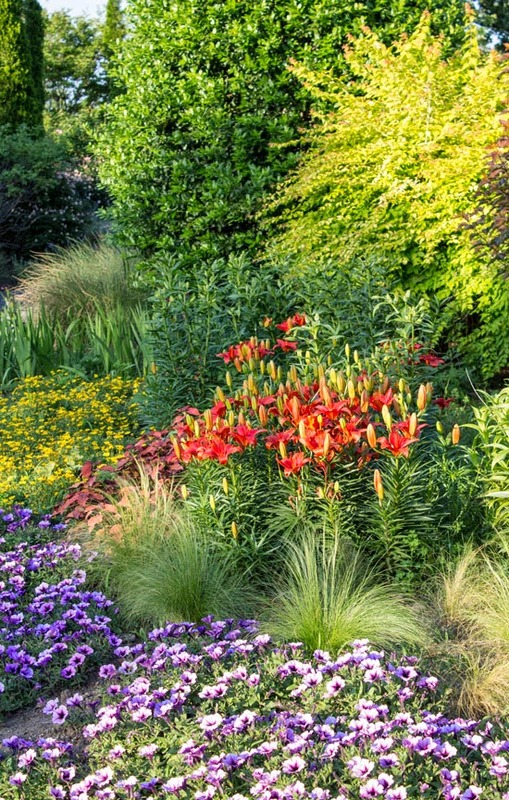 Gardens never go exactly as planned, so why not embrace the unexpected? Liven up your dull plantings with ephemeral bulbs like these alliums and you'll have a year of pleasant surprises - from new foliage to buds and from flowers to seedpods. Other great bulbs for this effect include rain lilies (Zephyranthes), crocuses, blood lilies (Haemanthus) and hurricane lilies (Lycoris). Don't stop with flowers though; anything from the annually peeling bark of a 'Natchez' crepe myrtle to the persistent winter berries of hollies can bring your garden that extra layer of interest. I hope you'll follow my adventures at Garden2Blog this week, and you can keep up with the other bloggers and sponsors attending by following the #G2B15 hashtag on Facebook, Twitter and Instagram.